I'll update this with pictures, just was a little excited and wanted to share with you guys/gals my excitement on ordering a Medicine Man snare. I plan on doing a full-kit w/PJ eventually, but right now just isn't time for it. So a snare will have to do as I have needed an upgrade for a LONG LONG time. Besides, I need to upgrade my cymbals before doing a new kit...plans to do so were recently put on hold (as the case usually goes) when I had a fender bender w/an 80 year old man at a dead stop in the middle of the freeway I was lucky as I had an order with Saluda just WAITING to be submitted and I held off for one day to think it over and literally the next afternoon the accident happened. Thanks again PJ....from what I've seen and heard, your work is amazing and I'm sure this snare will be no different. in talking with PJ I had a basic idea on what I wanted done. After he told me that he couldn't get birch in a 15 ply and that it required gluing a 10 and a 5 together which greatly increased the cost...I decided on 10 ply. I wanted a black chrome Medicine Man badge, but he said they didn't have any. My mom is really handy w/stains and various craft stuff, so right when it comes in I'll probably take it to their house and see if she can't darken it up for me. NY: I always do my best. Shine: I'm still waiting on the lugs. I'm waiting to hear back from Ego to see how long the turn around time is on them. Once I have them the rest will go quickly. dang those MM snare's always look good. I like whatchu got going on there NY. its got a nice industrial feel to it. real clean. im'a hit you up when I have some cash PJ, quote me on that! once I saw the hex lugs, I goo'd - I love the look they bring to the table. 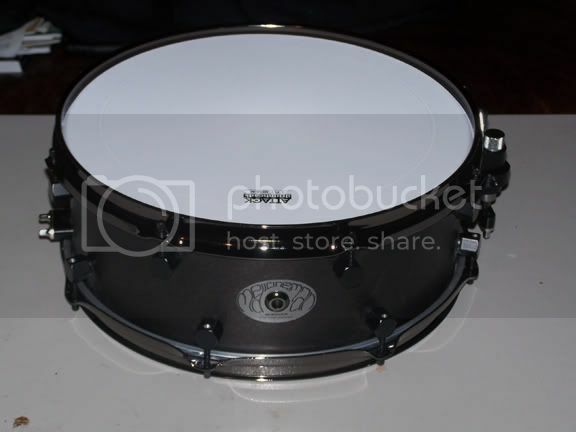 MM snare, gorgeous! I love mine, you'll be a happy man for sure! 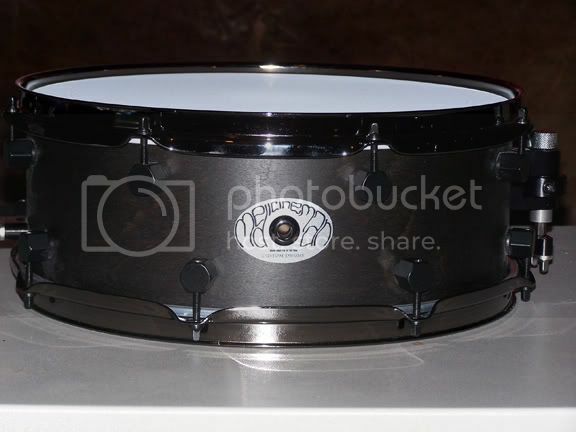 I hope you don't mind NY, but I'm borrowing the black satin finish for my next snare. PJ was kind enough to offer me a new snare because my back is now a Medicine Man custom drums billboard! Oh, and Rob I'm stealing your mini tubes idea too!